AWARD-winning Hull construction company Hobson and Porter Limited has been appointed as the main contractor on a new distribution depot in Howden. The scheme, a 36,408sqft bespoke logistics warehouse with a two-storey office building situated on Ozone Business Park, is being brought forward by leading East Yorkshire commercial developer, Horncastle Group PLC for DHL. DHL will join a range of big name companies on the site, including TNT, Warburtons, DPD, Timloc and Image Data, strengthening the business park’s reputation as one of the region’s top commercial and logistics hubs. The parcel company will occupy the last available plot on site, meaning that once the development is finished, Ozone Business Park will be completely build out. Ian Hodges, Managing Director of Horncastle Group, said Hobson and Porter had completed some excellent work at Ozone Business Park in the past and we are delighted to reappoint them. He said: “It is our policy, wherever possible, to employ local contractors because we believe this helps create a stronger local economy. Hobson and Porter have worked on other schemes at Ozone Business Park and always delivered a first-class job. Mr Hodges added it was an ‘defining moment’ to be commissioning the final build on Ozone Business Park. Mike Beal, Construction Director at Hobson and Porter, added: “We have a long history of working on Ozone Business Park so being appointed to carry out the final build is an honour for us. Ozone Business Park is a 32-acre site based on the A614 and is part of the Goole/Howden employment hub. DHL will take a lease on the property, which will serve as a parcel distribution depot for East Yorkshire and surrounding areas. 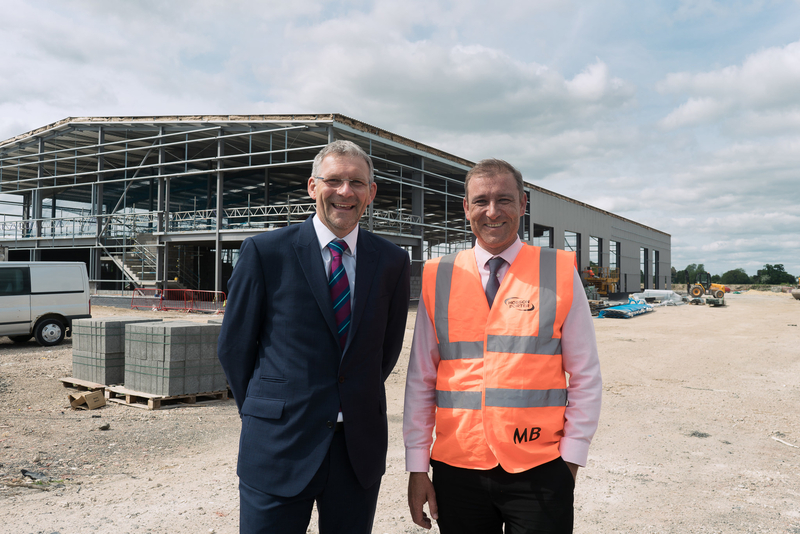 Picture caption: (L-R) Ian Hodges, Managing Director of the Horncastle Group PLC and Mike Beal, Construction Director at Hobson and Porter, outside DHL’s new office and warehouse development on Ozone Business Park, Howden.